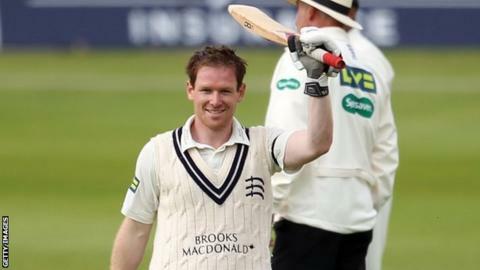 England batsman Eoin Morgan made his highest score for Middlesex to support another big ton for Australian opener Chris Rogers in their Championship Division One match at Trent Bridge. Having been put in, Middlesex made 417-5 against title rivals Nottinghamshire thanks largely to the 272-run third-wicket stand between Rogers and Morgan. Rogers finally went for 180, one of two victims for Andre Adams. But Morgan was still there at the close on day one, unbeaten on 174. Morgan's strokeplay lost nothing in comparison with Rogers as they brought up their 200 partnership at exactly five runs per over on a flat, unresponsive strip, being used for the first time this season. He twice lifted England one-day team-mate Samit Patel down the ground for the day's two sixes, on top of his 27 fours, one more than Rogers. Having also hit a ton in his last four-day match for Middlesex against Lancashire back in May, it meant back-to-back hundreds for Morgan, who had not previously hit a Championship century in five years. Earlier, Dawid Malan kept Middlesex captain Rogers company for 57 minutes before losing his off bail to Adams and then Neil Dexter went without scoring, edging Harry Gurney to first slip. Rogers, who hit a match-winning double century against Yorkshire in April, went on to reach three figures in the Championship for the third time this summer before being caught on the cover boundary, having just been put down on 170. By contrast, Rogers' Ashes-winning Australia team-mate Peter Siddle was on the receiving end as Middlesex punished the hosts' decision to field first. But Siddle did finally get some reward late in the day when he had Joe Denly caught at second slip before bowling John Simpson. "We wanted to win the toss and put them in, so we are disappointed we didn't make the most of the morning conditions. "It looked ideal to bowl first but perhaps we are not reading the pitches very well because we thought there would be a lot more in it for the bowlers." "The partnership has put us in a great position. We got on a bit of a roll and I thought we both played pretty well. We had a fair bit of luck early on but managed to cash in. "If you can get up to around 420 in a day you are in a great position to go on and win the game." "It was a tough day at the office for the Notts attack, who ran headlong into two of the classiest performers in the game, in Chris Rogers and Eoin Morgan. "The surface offered very little assistance to the bowlers, who would have been dreadfully disappointed not to make more of the early cloud cover. "Many congratulations go to Luke Fletcher, Harry Gurney and Riki Wessels, who were all awarded their caps before start of play. " "Chris Rogers edged wide of third slip in the opening over but proceeded to take the attack to Nottinghamshire as he powered his way to yet another big century. "With Sam Robson on Test duty, Dawid Malan and Neil Dexter both pushed up one place in the order but neither were able to capitalise. Instead, Eoin Morgan made up for lost time. "The destruction caused by Rogers and Morgan, as the visitors moved from 97-2 at lunch to 288-2 at tea, has given them an incredibly strong position at stumps."